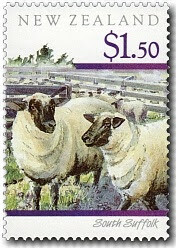 The cornerstone of New Zealand's farm-based economy has always been sheep; a common saying since the early days of the colony has been that the people of New Zealand 'live off the sheep's back'. Although we are now active in the export of a diverse range of other goods, sheep remain a mainstay of our prosperity, right up until more recently when another farming sector, dairy took over. 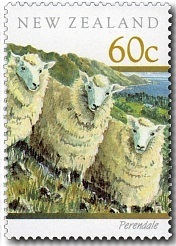 It is probable that the first sheep to set foot on New Zealand arrived in 1814 with the missionary Samuel Marsden. 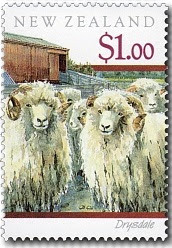 It was not until after 1834, however, when the first Australian merinos were landed on Mana Island, bound for the Wairarapa, that sheep were farmed in any volume - and a flourishing wool trade with Europe was developed. 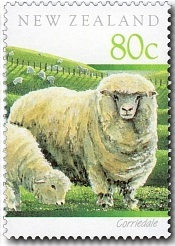 An export trade in sheep meat was initiated in 1882, and today New Zealand has an enviable international reputation as an efficient producer and exporter of top quality meat and wool products. 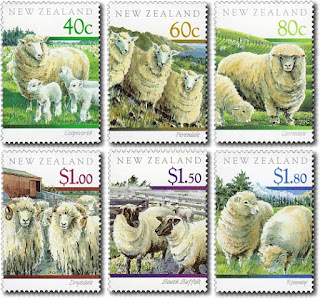 In New Zealand, sheep are raised for both meat and wool. Since the mid 19th century, New Zealand farmers have worked to perfect breeds which meet the dual purpose needs of both wool and meat. The dual purpose breeds are favoured for their valuable fleece, regular lamb production, multiple births, good maternal instincts, high milk production and easy care characteristics. 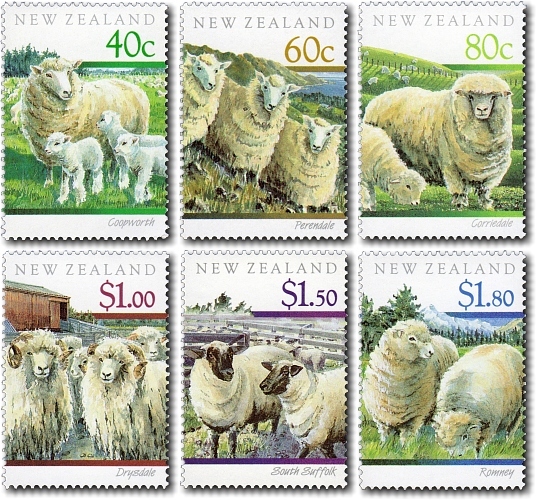 Five successful New Zealand cross-breeds, along with the traditional English Romney, are featured in this stamp issue. 40c - Coopworth / Romney and Border Leicester Cross. Somewhat similar in appearance to the Perendale, this cross between a Border Leicester ram and a Romney ewe is larger with a coarser, heavier fleece of wool in the general purpose class. The breed has increased in numbers, mainly at the expense of the Romney to which they have proved superior under some conditions. They prosper on productive land where farmers require higher lamb numbers. 60c - Perendale / Romney and Cheviot Cross. This breed was developed with a particularly strong constitution making it ideal for less productive, wet hilly conditions. While the wool weight is not as great as that of the Romney, the wool is bulkier and of good, general purpose quality for use in knit wools, wool jersey and the medium to heavier uses. Perendales are prolific producers of large lean lambs making this an excellent dual purpose breed. 80c - Corriedale / Merino, Lincoln, Border Leicester and Romney Cross. The Corriedale is found in the hill country of Canterbury, Otago and Southland. As it does not like extremely wet conditions the light rainfall of these areas suit it well. 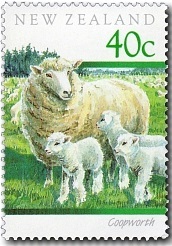 It was the first synthetic breed developed in New Zealand, evolved from British Longwool and Merino crosses. The wool, as with many other halfbreed varieties, lacks the softness of Merino, being coarser and harder. It is used where good quality and hard wearing attributes are sought. $1.00 - Drysdale / Romney Extraction. Developed as a special purpose carpet wool sheep from a Romney strain the Drysdale produces wool with high resilience so important for carpet use. The wool must be hard wearing and springy to recover quickly from flattening. Breeding is strictly controlled and kept to supervised closed flocks to prevent inadvertent mixing with other apparel wools. This horned sheep is handy, vigorous, a good breeder and very valuable to New Zealand's sheep industry. $1.50 - South Suffolk / Southdown and Suffolk Cross. The wool of the South Suffolk is Down type and not of high quality but this is no detriment to the breed as it is used solely for meat production in export prime lamb. It is intermediate between its parent breeds - heavier than a Southdown but not as big as a Suffolk. The head and legs are free of wool and are a dark brown colour. Export demands have changed toward leaner meat breeds including the South Suffolk. 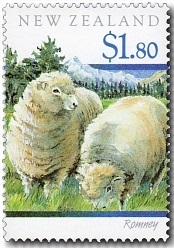 Brought to New Zealand in 1853, the Romney is now the predominant breed of sheep in this country. At least 50 per cent of New Zealand sheep are Romney. It originally evolved in the wet, exposed environment of southern England. In New Zealand, it can be found successfully coping with any situation from the flat to steep hills. The wool is used in carpets, blankets, tweeds and furniture coverings. It has earned New Zealand millions of dollars in both wool and meat. I am a bit disappointed Anne. I would have thought a farmer like you would have done a better job of this.